All bread is not created equal. 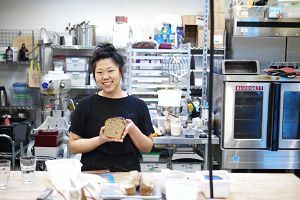 In fact, there are as many different ways of making bread as there are people, according to bread master and slow food enthusiast, Chef Annabelle Choi. What’s the difference between Annabelle’s style of bread and what you’ll find at the supermarket? 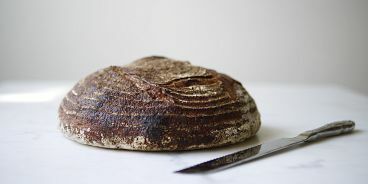 “I’d like to think the sourdough I make reflects the time and respect I have for the process, one that has been cultivated for centuries,” she says. Mass-produced bread is made with nutrient-free cheap wheat and preservatives to ensure a longer shelf-life. I learned this and so much more at one of Annabelle’s three-hour All-Natural Sourdough Bread Workshops which she hosts about once a month out of Elysian Coffee in Mount Pleasant (see annabellechoistudio.com for class listings). Before our class ended, I couldn’t resist asking: where can we buy this beautiful old-fashioned kind of bread in Vancouver? Matchstick Coffee was her first answer. Three years ago, Annabelle was at the reigns of Matchstick’s pastry and bread program. She’s since passed the torch to pastry chef and baker Kirk Switzer, a fellow slow bread devotee, who fell in love with bread baking well before it became the focus of his career. Years ago, he and his father built a wood-fired bread oven at their family’s cabin just for fun. After completing VCC’s Pastry and Baking Program, Kirk worked at Beaucoup Bakery and then decided to dive into the world of bread even further by enrolling in bread classes at the San Francisco Baking Institute (a world-renowned destination for artisan bread studies). Now back in Vancouver, Kirk focuses his passion on Matchstick’s bread and pastry program where one hundred per cent of offerings (bread, croissants, muffins, cookies, scones etc.) are made in-house. One type of bread is on offer (sourdough), but Kirk says a wider scope is in the works. What makes this bread so special? It’s simple. As Annabelle explained, our great-grandmothers would recognize it as food. But the recipe (which includes flour, water and salt), is just the starting point, “The process is where all the magic happens,” she says. Kirk and Annabelle also share the belief that their “slow method” of making bread is healthier, “Allowing the appropriate amount of time for natural fermentation to act on the bread dough allows it to fully break down those whole grains, making their nutritional content more available for our body to absorb,” Kirk explains. 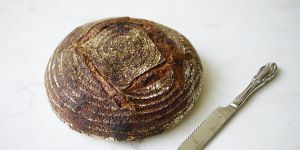 You can find Matchstick’s sourdough bread at either of their two locations (Mount Pleasant and Chinatown) in toast, sandwich and full loaf form. And look for their third cafe location opening soon at Main and 32nd. This article was written for metronews.ca.